Tyne Bank Brewery: Fourth Birthday Party. In just over two weeks time we are throwing our doors open and inviting you all to help us celebrate four years of Tyne Bank Brewery, with an evening of beer, food and live music on Friday 5th June. Last year's birthday party was in incredible success, it blew us away but we held it together and it was a great night. We are better prepared this time, we'll have our pop up bar serving four cask ales and four keg beers, with a great range of Tyne Bank favourites and some one-off beers for the event. We'll also have our bottled range, real cider, soft drinks and Motueka hop gin! This year we have more live music, kicking off their summer tour and returning to the brewery for a headline set, we'll have our friends the excellent Holy Moly & The Crackers. "Influenced by an eclectic range of styles and artists; the honest grit and gravel of Woody Guthrie, the gypsy bone-cage burlesque of Gogol Bordello, the spectral clarity of Joni Mitchell. As such they play a lively, moonshine mix of Romani, Americana and contemporary British folk-rock." Playing the main support slot we have singer-songwriter Martha Wheatley. "Moving between genres as fearlessly as crossing borders, travelling singer/songwriter Martha Wheatley takes you on a musical journey you shan't forget! Fusing elements of folk, rap and reggae to conjure memorable and engaging songs, this unique take on songwriting is sure to charm." We will have another act opening our music lineup for the evening, which is yet to be properly confirmed. My plan is to get a band together for the night, but its looking like it might just be me and my guitar! 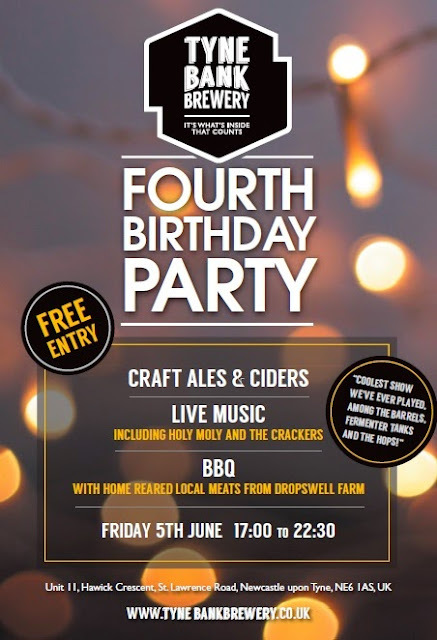 To soak up all the delicious beer we'll have a hog roast from Dropswell Farm, great local producers of high quality meat. We will endeavour to keep prices as low as we can so you can try as many beers as you like without breaking the bank. Set the date in your diary and join us for beers just feet away from where we brew them, enjoy some great live music and hang out with us in the brewery. We also promise to have more toilets this year!